Last February, the unthinkable happened. Can you see the contrast in color? I was pissed so I messaged my friend. My friend Kath said she uses the Coach leather cleaner. 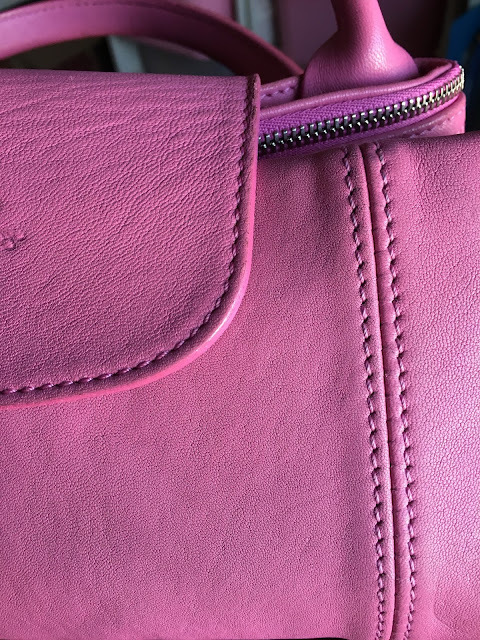 My other friend Maymay said that she has a Kate Spade leather cleaner that I can use. There was hope. I can try these methods and if all else fails - I guess, it's alright since the stain is at the back of the bag. 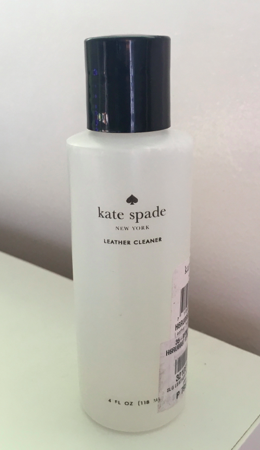 I finally got hold of the Kate Spade leather cleaner. Maymay told he that she was instructed by the store staff to use cotton. So I followed her. I used cotton to try and clean it. Slowly but surely - it WORKED! But the thing was, my arm was getting tired from rubbing! Hahaha!! It was taking longer than usual but I told myself to be patient, well - I needed to be patient or else nothing will come out of it! So I rested for like 2 days. Hahahaha!! :) Then I tried it again. But after 2 days of using cotton balls. I gave up. It was too much work! Hahaha. Seriously, I was thinking too much work with just a little difference. My Panget was actually smirking and asking if it really works. I then remembered that I had small cut ups of Melamine Sponge (aka Mr. Clean's Eraser) that we got in Daiso Tokyo last November. I then took the risk and tried it on a small portion. 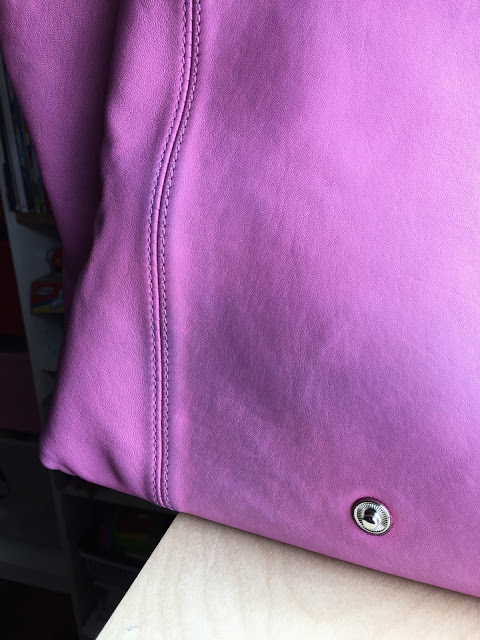 I put the leather cleaner on the surface of the small melamine sponge, squeezed it so that the product will get into the sponge. I slowly rubbed it on the leather surface in a circular motion. 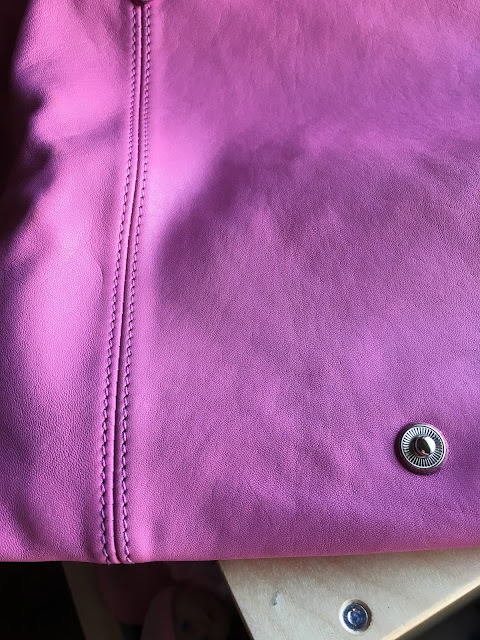 I was nervous and secretly praying that the leather won't get damaged. Without much effort - IT WORKED! I was in disbelief how fast it took the stain out! So I tried it again on another portion of the bag. And it still worked! I was soooo happy that I was cleaning like crazy! Hahaha.. I had to *gently* rub the melamine sponge on the flat surface of the bag. 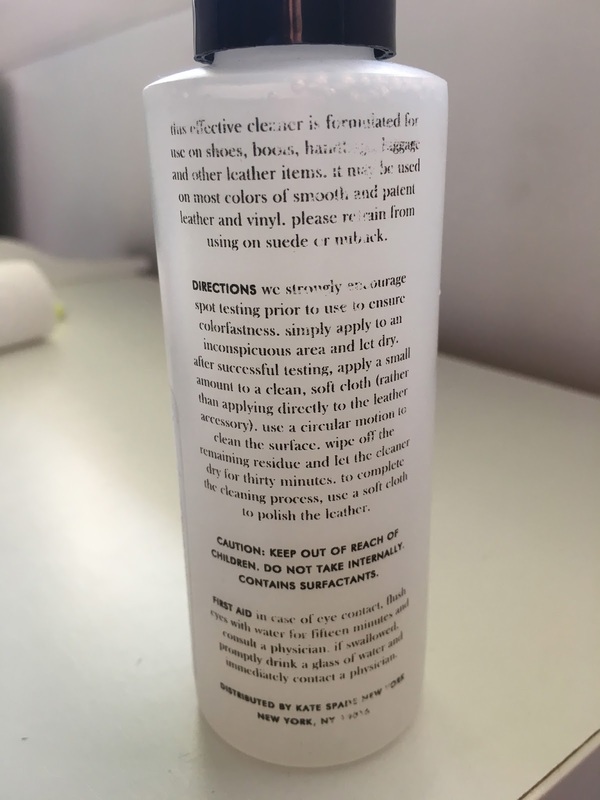 I also learned that the more product you use, the better and easier to clean. Make sure to use enough product that when you rub, it'll create suds/bubbles. The leather cleaner instructions suggests that you don't put the cleaner directly on the bag, but I did just that. Hahaha!! But don't take my word for it, you can try it and risk it. I did and it turned out okay naman. There's a huge difference right?! Bye Bye Demin stains!! Woohooo!! Can you spot the damage? Good thing it's at the bottom of the bag!! Here's the side by side image of the bag with denim stain and without the demin stain. 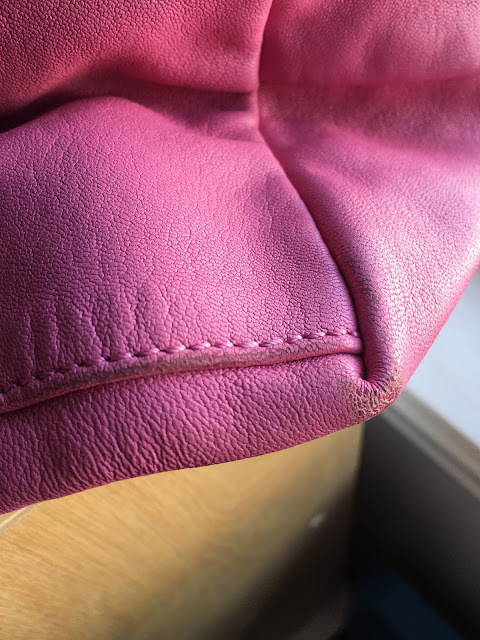 So, THANK YOU Maymay for letting me use your Kate Spade leather cleaner! 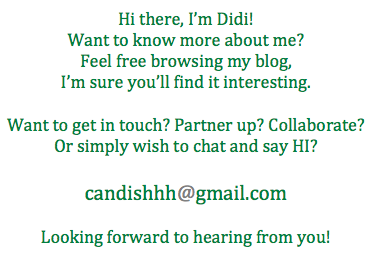 Did you know that you can shorten your long urls with LinkShrink and make $$$$ for every visitor to your short links.